Atlantis can create automatic and regular backups of all open documents. Successive versions of each document are saved to a special folder. In this way, you will always be able to go back to earlier versions of any document. When you want to restore an earlier version of a document, you simply have to find a backup file created at the required date & time. To enable automatic creation of backup files, check the Backup every box in this dialog. You can specify the minimal time interval between two backups of a document (use a combo box next to the Backup every box). 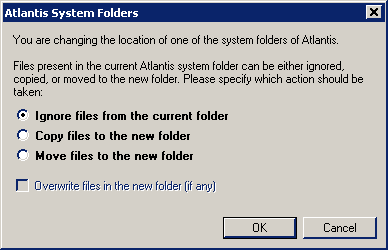 By default Atlantis will save backups to the Backup folder under the home folder of Atlantis (the current location of the Atlantis Backup folder is indicated in the Backup Folder box). 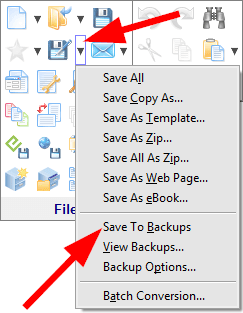 But you could change the location of your Backup folder by clicking the Browse... button on the right of the Backup Folder box. Note that before clicking the Browse... button you should first create a new backup folder at the desired location on your disk using your file manager (normally Windows Explorer). If the Each document has a separate backup sub-folder box is unchecked, the Backups for all documents are stored under the same folder. For example, if the home folder of Atlantis is C:\Program Files\Atlantis, the backups for all documents will be saved directly to the following folder: C:\Program Files\Atlantis\Backup. If the Each document has a separate backup sub-folder box is checked, Atlantis will create a separate folder for the backups of each document. For example, if the home folder of Atlantis is C:\Program Files\Atlantis, the backups for the document "Doc01.rtf" will be saved to the following folder: C:\Program Files\Atlantis\Backup\Doc01.rtf\. We recommend to check this option if you have to work on many documents. This would allow you to manage the backups of your documents in an easier way. Use the Maximum number of backup files for a document box to specify how many backups are allowed for each document. 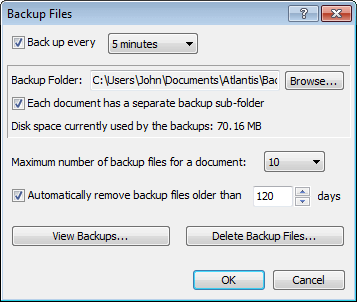 When the backups for a document reach this maximum, Atlantis will automatically replace the oldest backup with the new one. If Max is specified for the Maximum number of backup files for a document, the maximum number or backups for this document will only be limited by the available free disk space. Use the Maximum amount of disk space to use for backup files controls to specify how much disk space Atlantis is allowed to use for the document backups. When this maximum amount of disk space is reached, Atlantis will remove some of the oldest backups before adding new ones. Click the Browse Backup Folder... if you want to review files contained by the Backup folder. You could remove excess files or folders, or copy the desired files from the Backup folder to another folder. Note: Please never rename the files in the Backup folder directly. 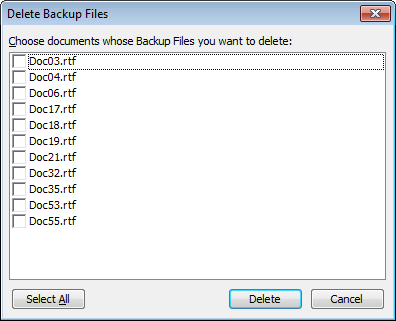 If you rename them, the Backup Files feature of Atlantis might work wrongly. If you want to use a backed up file in some way, please copy it to another folder, then rename or modify it there. You can use this command to backup a document only in so far as you feel it is a significant version.